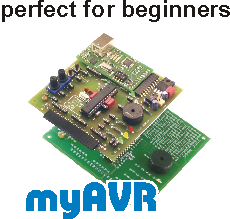 All system boards of myAVR can be extended with these Add-Ons and modules. The connection to the system board is easily implemented using header with myAVR bus standard. A selection of these hardware enhancements can be purchased as a kit. It adds four relay outputs to your myAVR board. The power supply to equip themselves. 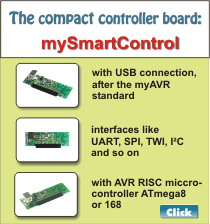 For example for the mySmartControl, the myMultiProg USB or own circuits. 20 patch cables and a 9 V battery clip.